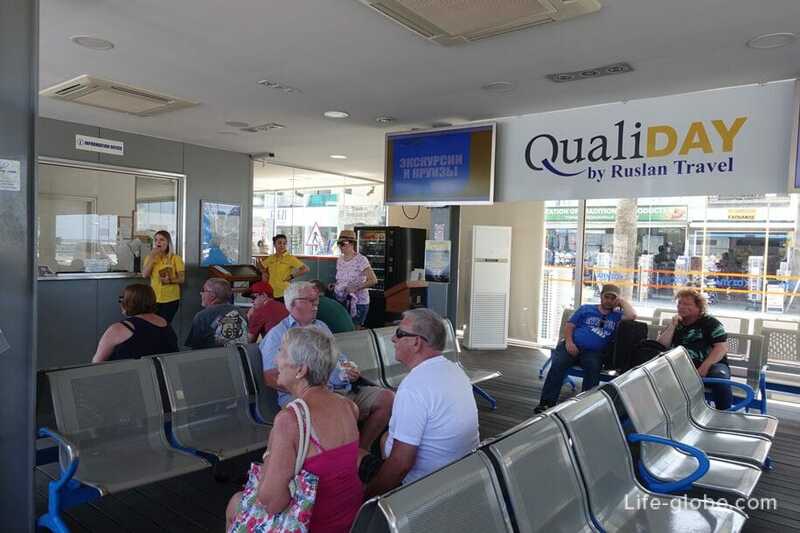 In addition to taxis and rental car to get around Paphos and surrounding areas is by bus. Buses - the only public transport to Paphos. 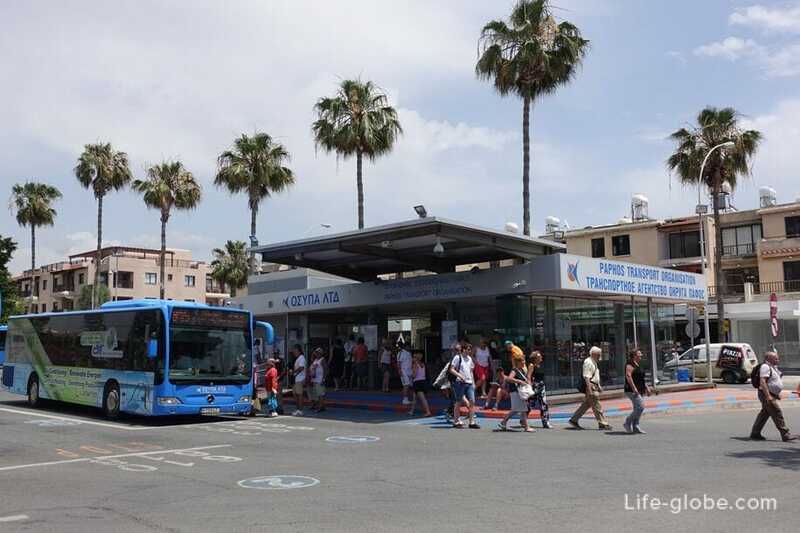 The bus network in Paphos well developed and contains urban and suburban routes. Most tourists use the station Harbour. From this bus station buses depart for the nearby trails. Karavella bus station is used mostly for commuter transportation over longer distances, including in Limassol, Larnaca and Nicosia. The bus link between the bus routes №№ 603 and 618. From the bus station, the Harbour, you can go to the main nearby attractions, the beaches of the surrounding area of Paphos, Paphos airport and Pissouri and Polis. - 631 Kato Paphos - Kouklia - Aphrodite's Rock. 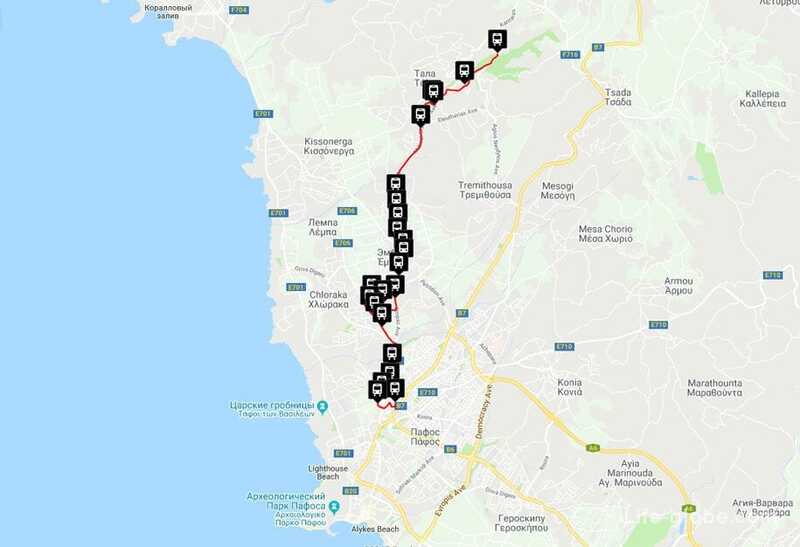 This route connects the port of Kato Paphos with Alfamega supermarket, on the way making stops around the city. - from a supermarket at the station Harbour: 16:00 - 20:00 (every hour), 22:00 - 0:00 (every hour). 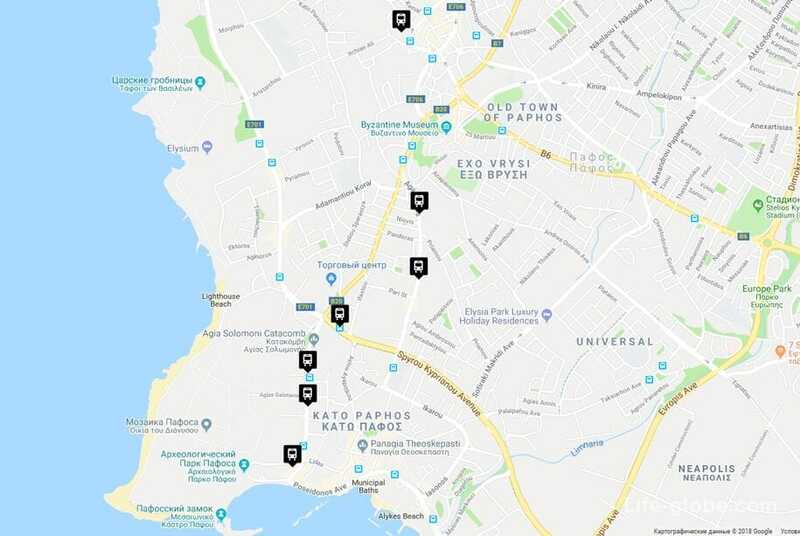 The bus route 603В: Harbour Station, Ledas, Artemidos, Poseidonos, Iasonos, Ikarou, Agapinoros, Priamou, Sotiraki Markides, Nikou Nikolaides, Georgiou, Ioannide, Taxiarchon, Christodoulou Sozou, Alexandrou Papagou (Alfamega). This route connects the port of Kato Paphos to the town centre and municipal market, which is very popular among tourists. - from June to August (daily): 06:25, 06:50, 07:20, 08:05 - 14:20 (every 15 minutes), 14:40 - 16:20 (every 20 minutes), 16:35 - 23:35 (every 30 minutes). - from June to August (daily): 06:15, 06:35, 07:05, 07:35, 08:05 - 14:20 (every 15 minutes), 14:40 - 16:20 (every 20 minutes), 16:50 - 23:20 (every 30 minutes). The route movement of the bus 610: Municipal market, Fellachoglou, Leontiou, Thermopylon, Nikodemou Mylona, Ap. Pavlou, Agapinoros, Ag. Anargyron Av., Ap. Pavlou, Harbour (Main Station). 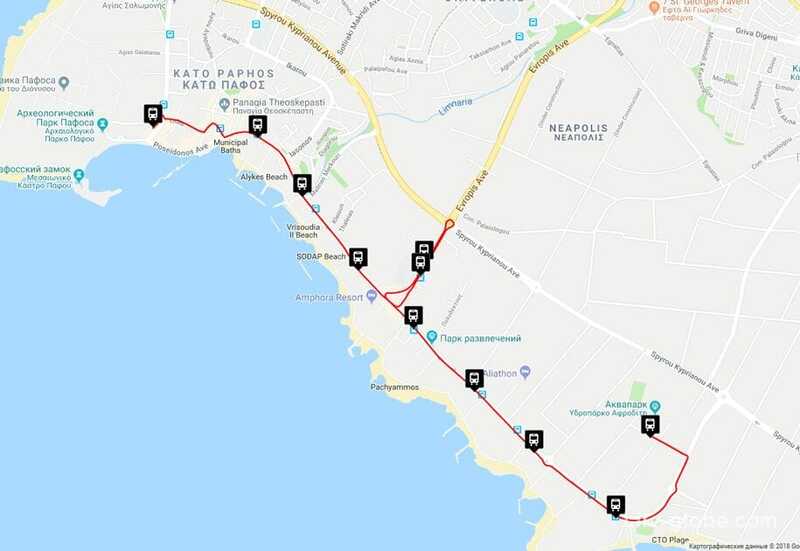 These routes connect the port of Kato Paphos promenade and beach Geroskipou and stop at Luna Park (Paphos Waterpark) and water Park (Paphos Waterpark). - from Geroskipou to the harbour: 07:30, 08:40, 09:50, 11:00, 14:20, 15:30, 16:45, 17:55, 19:05. 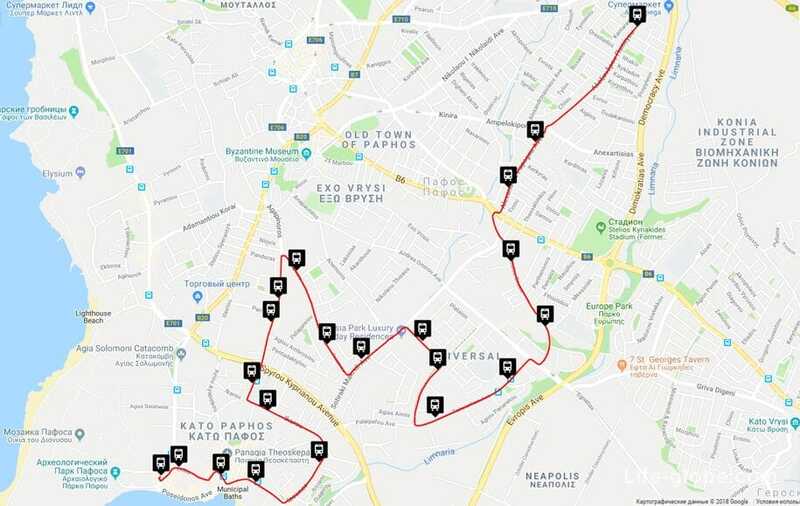 The bus route 606: Makariou Geroskipou (Royal Clinic), Anth Savva Georgiou, Griva Digeni, Kyriakou Partaside, Makariou Av., Ippokratous, Yianni Kontou, Kon Palaiologou, Spyrou Kyprianou, Geroskipou municipal Beach, Poseidonos, Danais, Spyrou Kyprianou, Agion Anargyron (Kings Av. Mall), Ap. Pavlou, Harbour Bus Station. - from June to August (daily): 6:25, 6:50, 7:20, 7:50, 8:05 - 10:45 (every 10 minutes), 11:00 - 14:20 (every 10-15 minutes), 14:35 - 16:45 (every 10 minutes), 17:00, 17:15, 17:30, 17:50. - from June to August (daily): 6:40, 7:05, 7:35, 8:00, 8:20 - 12:55 (every 10-15 minutes), 13: 15, 13:30, 13:45, 13: 55,14: 10, 14: 25,14: 35, 14:50, 15:05 - 16:05 (every 10 minutes), 16:10 - 16:50 (every 10 minutes), 17: 05, 17:20, 17:30, 17:45, 18:05. 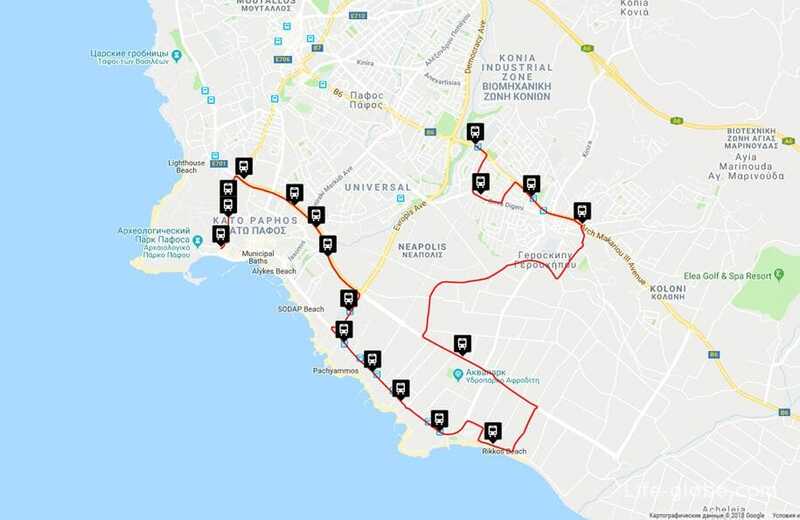 - from December to March: from Harbour - 18:05 - 20:35 (every 30 minutes), 21:50 - 00:20 (every 30 minutes); from Geroskipou - 18: 20 - 20:50 (every 30 minutes), 22:05 - 00:35 (every 30 minutes). 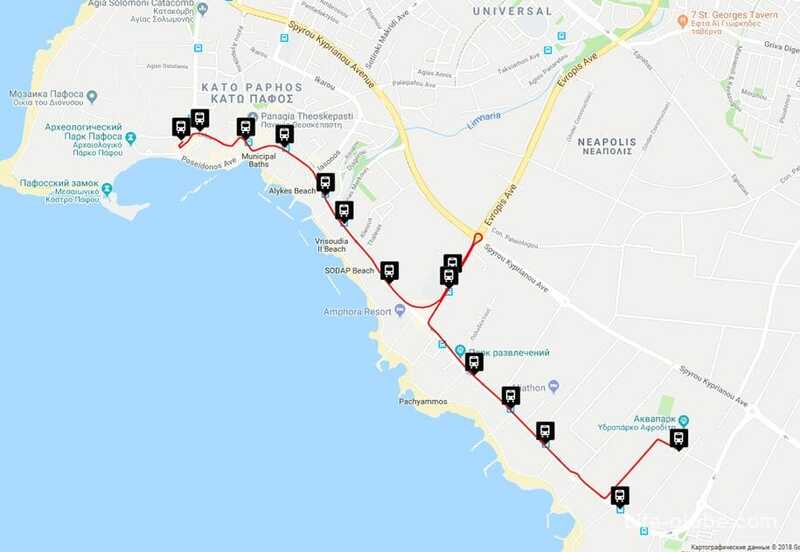 The route movement of the bus 611: Geroskipou Beach (Waterpark), Poseidonos Av., Danaes Av., Poseidonos, Artemidos, Ledas, Harbour (Main Station). This route connects the port of Kato Paphos international airport Paphos. 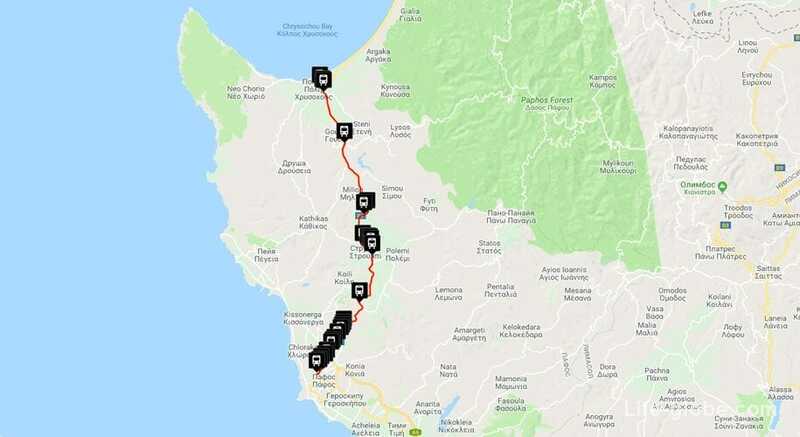 This route connects the port of Kato Paphos with one of the most popular nearby resorts of Paphos - Coral Bay, in the municipality of Peyia. Also on this route you can drive to the Royal tombs. - from June to August (daily): 7:00, 7:25, 8:05, 8:35, 8:45, 8:55, 9:05, 9:20 - 12 : 40 (every 10 minutes), 12:55, 13:10, 13:20, 13:30, 13:45, 14:00 - 17:00 (every 10 minutes), 17: 15,17: 30, 17 : 45, 18:00, 18:20. 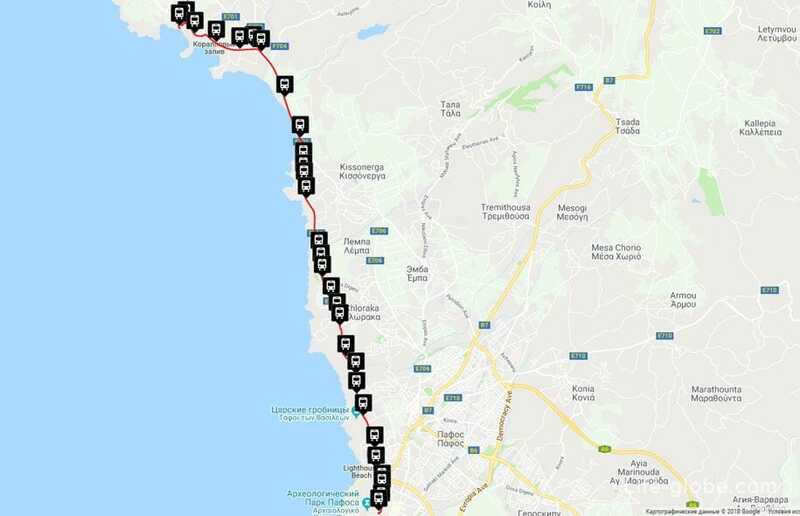 - from December to March (daily): from Paphos: 18: 00-23: 15 (every 35 minutes); from Coral Bay: 18: 35-23: 50 (every 35 minutes). 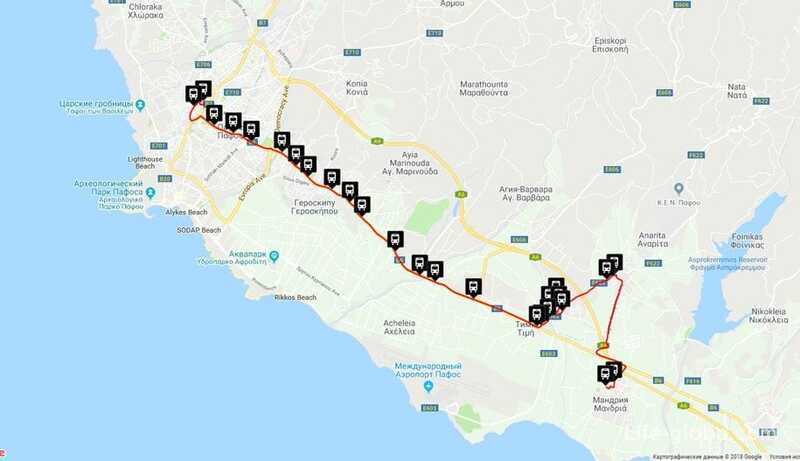 This route connects the port of Kato Paphos with one of the most popular nearby attractions of Paphos is the rock of Aphrodite, in the village of Kouklia. Also on this route you can visit Kouklia, where, in Paleo Paphos is the equally famous temple of Aphrodite. - Sunday + holidays: 06:30, 9:10, 10:40, 14:10, 14:20, 15:40, 16:00, 17:30, 18:40, 22:30. - Sunday + holidays: 06:30, 9:10, 10:40, 14:10, 16:00, 18:40, 22:30. - from December to March: 08:15, 10:05, 11:35, 15:05, 16:55, 19:30, 0:00. 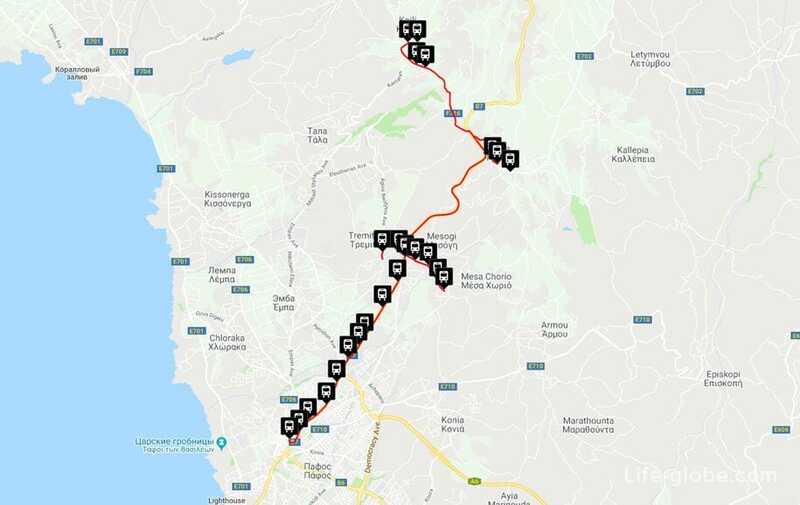 The bus route 631: Harbour (Main Station), Ledas, Alkminis, Poseidonos Av., Danaes Av., Aphrodite's Av., Spyrou Kyprianou Av., Gianni Kontou, Ippokratous, Makariou Av., Paphos-Limassol old Road, Kouklia Archeological Site, Petra tou Romiou. - 641 and 645 Karavella - Polis. This route connects the Karavella bus station to the village of Mandria. The bus route 601: Karavella (Main Station), Nikodemou Mylona, Gladstonos,Griva Digeni, Evagora Pallikarides, Char. Mouskou, Nik.Nikolaide, Kinyra, Ampelokipon, Anexartisias, Demokratias, Archiepiskopou Makariou (Geroskipou), Koloni, Acheleia, Archiepiskopou Makariou (Timi), Salaminas (Timi), Agias Sofias (Timi), Agias Irinis (Timi), Agias Marinas (Anarita), Eleftherias (Mandria), Gypsou (Mandria). 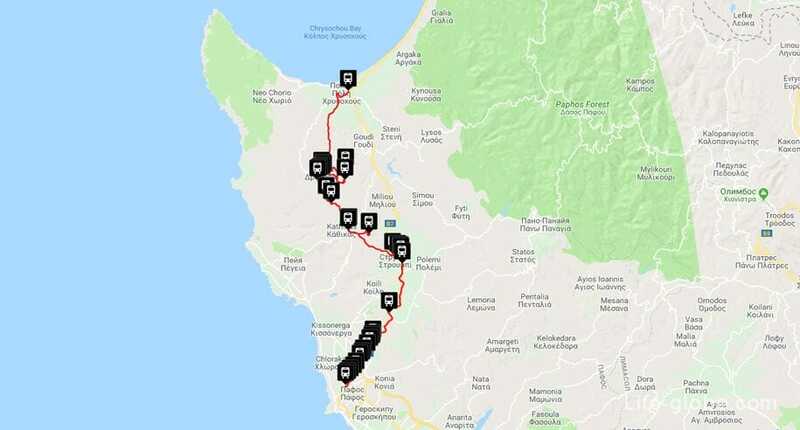 This route connects the Karavella bus station and Saint Neophytos monastery (Tala). - Saturday: 08:10, 10:50, 15:00, 17:40. - Saturday: 08:50, 11:30, 15:40, 18:20. The bus route 604: Karavella (Main Station), P. Miltiadous (Municipal Market), Fellahoglou, N. Ellina, Akamantidos, Archiepiskopou Makariou (Chloraka), Christou Kelli, Archiepiskopou Makariou (Emba), N. Ellina, M. Stylianou (Tala), Agios Neofytos Monastery. This route connects the bus station Caravella and Akoursos, where, at a distance of several kilometers from a stop is the temple of Adonis (Adonis Baths). Passing close to the beaches of Coral Bay. The bus route 607: Karavella (Main Station), P. Miltiadous (Municipal Market), Fellachoglou, Ν. Ellina, Akamantidos, Archiepiskopou Makariou (Chloraka), Eleftherias, L., Papacosta, Lemba village, Chr. Kelli (Kissonerga), coastal road of Kissonerga-Pegeia, Μ. Κyprianou, Pegeia Square (Akoursos). This route connects the Karavella bus station to the international airport of Paphos. This route connects the Karavella bus station to the village Koili, where, at a distance of several kilometers from a stop is the temple of Adonis (Adonis Baths). The bus route 614: Karavella (Main Station, Evagora Pallikaridi, Ellados, Leoforos Mesogis,Tremithousa,Mesogi, Mesa Chorio Tsada, Koili. This route connects the Karavella bus station to the resort of Pissouri. Passing the rock of Aphrodite and the beach of Aphrodite. - from Pissouri to Paphos: 07:40, 10:40, 15:40. 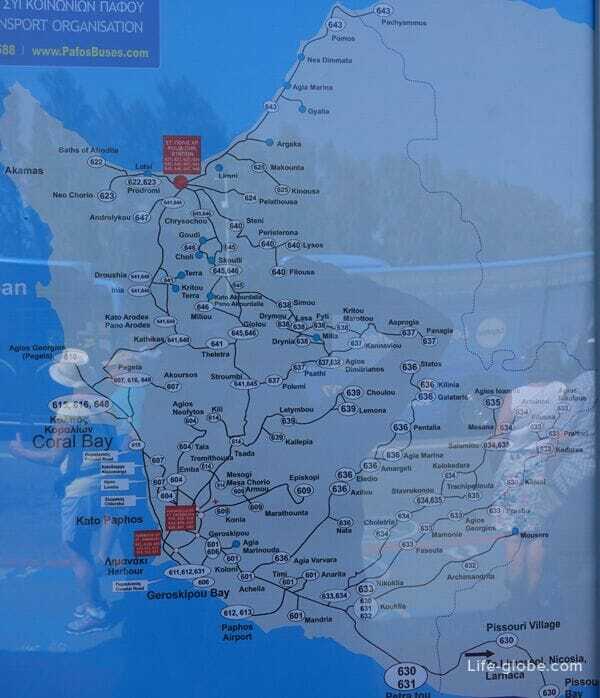 In Pissouri, the bus makes two stops: in the centre of Pissouri Village and near the beaches of Pissouri Bay. The bus route 630: Karavella Station, Neofytou Nikolaides (Government Offices), Geroskipou, Koloni, Acheleia, Timi (Limassol - Paphos old Road), Kouklia (Archaeological Site), Petra tou Romiou, Pissouri Village, Pissouri Bay. These routes connect the Karavella bus station with city Polis. - Sunday: 10:00, 12:00, 13:00, 14:00, 15:00, 17:00, 18:00, 20:00. - Sunday: 9:00, 11:00, 12:00, 13:00, 14:00, 16:00, 17:00, 19:00. There is also a direct bus No. 648 from coral Bay to Polis and direct bus № 649 from Paphos airport to Polis. 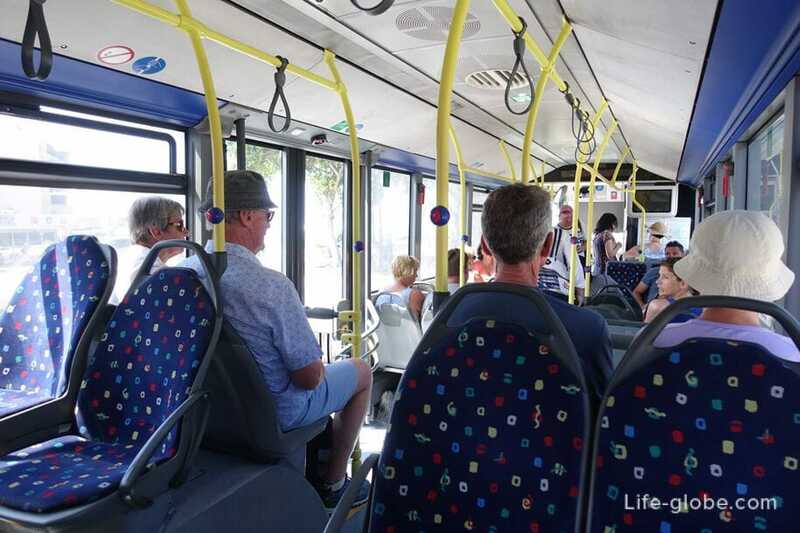 The cost of travel in public buses in Paphos and surrounding areas is € 1.50. After 21:00 cost night ticket is € 2.50. Luggage and tax included in the ticket price.